To be honest, I was so busy with wedding planning and all the details of the big day that I really didn't put much thought into our honeymoon leading up to it. I'm normally SUCH a planner, especially when it comes to travel, but this trip I totally went with the flow. It made for the most relaxing vacation. We didn't make a single reservation and it felt so nice to wake up every morning with no plans or obligations. We just recently found out that we'll be returning to Maui n August for my brother-in-law LeBraun soon to be sister-in-law Shalan's wedding! We couldn't be more excited for them and to travel there as a family. Below you'll find a few of my favorite restaurants and activities on the island. My best advice would be not to over plan because half the beauty of Maui lies in the unexpected adventure. We stayed at Andaz Maui and it was absolutely perfect. The entire hotel elicits a serene and peaceful feeling. No matter where you are on the property, you feel connected to the ocean and the beach at all times. Some of my favorite memories were watching the sunrises and sunsets from our porch. Whether we were sitting poolside with a tropical cocktail, walking along the beach or simply relaxing in our room, we felt completely at home at Andaz. The hotel offers tons of activities including free snorkeling equipment, drink mixology classes (highly recommend!) and complimentary GoPro rentals to document your daily adventures. The property has five pools including three ocean-facing cascading infinity pools. I would definitely recommend staying at Andaz for a couple's getaway or a relaxing beach vacation. From the moment you arrive, you're greeted with a warm aloha welcome, beautiful leis and a refreshing drink. It is also in a prime location in Wailea with just a short drive to many restaurants and shopping centers. THE MONKEY POD KITCHEN - I'm not too proud of this, but we may or may not have dined at the same restaurant four times on our ten day trip. Monkey Pod Kitchen really is THAT good. If you do one thing for me, you have to try the Monkeypod Mai Tai. It's topped with passionfruit foam and made with homemade macadamia nut syrup. It's absolutely delicious and just tastes like Hawaii in a cup. Hands down the best Mai Tai you'll ever have. We also enjoyed sampling some local craft beers including the Bikini Blonde from Maui Brewing Company. 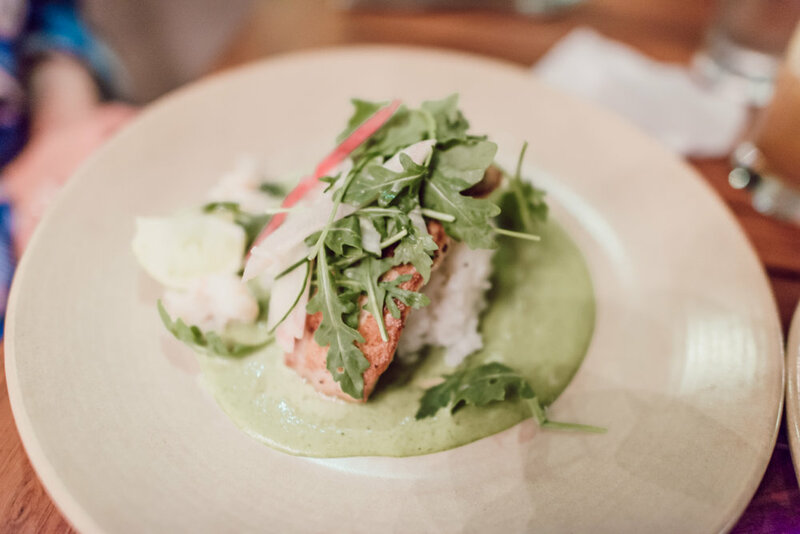 My favorite dish on The Monkey Pod menu was a special: the Green Curry Snapper. The Hamakua Wild Mushroom & Truffle Oil Pizza and the Island Herbs Farm Organic Kale salad were two other noteworthy dishes. We're probably more excited to go back to Monkey Pod than anywhere else on the island! My mouth is watering just thinking about their amazing Mai Tais. LONGHI'S BREAKFAST - The best breakfast/brunch we had off the Andaz property was at Longhi's. We had a wonderful brunch one of our first days on the island. They have the best Macadamia Nut Pancakes!!! The restaurants itself has a great vibe with black and white checkered floors and outdoor seating with a beautiful patio. It reminded me of a restaurant you'd find in Miami. MAMA'S FISH HOUSE - Mama's Fish House was probably the #1 most recommended restaurant, and it did not disappoint! After our day-long adventure on the Road to Hana, we were more than ready for a delicious dinner. It is filled with eclectic and colorful decor and you can get a sense of the rich tradition from the many photos lining the walls. One of my favorite details of the menu is that they include the name of the fisherman who provided that day's catch. They process and serve all of their fish within 24 hours so quality and freshness is always guaranteed at Mama's. One of my favorite dishes was the Opakapaka (pink snapper) served in a coconut. You can't leave without trying Mama's Stuffed Fish! They stuff the catch of the day with crab and lobster and bake it all in a macadamia nut crust. KA'ANA KITCHEN (ANDAZ) - Andaz doesn't offer your average hotel food. We typically avoid hotel restaurants, but after persuasion from several locals we gave them a shot, and they were so right!! We had a great experience at every restaurant on the property. They go out of their way to provide authentic, farm-fresh Hawaiian fare. Ka'ana Kitchen, open for breakfast, lunch and dinner serves up farm-to-table cuisine expertly prepared to stimulate your sense of adventure. I developed a taste for everything lilikoi (passionfruit) flavored on our trip, and our amazing bartender Archer whipped up the most fantastic and refreshing lilikoi drink for me. Their cocktails are truly outstanding and are all made with fresh ingredients local to the island. We also dined at Ka'na Kitchen for breakfast several times on the trip. They offer local Hawaiian dishes such as the Loco Moco in the morning. This was Cameron's favorite breakfast of the whole week and I couldn't get enough of their mouth-watering acai bowls every morning. Believe it or not, I went snorkeling for the first time on our honeymoon! I was nervous to go straight out on a guided tour so Cameron and I practiced right out in front of Andaz. I didn't expect to see much, but I was absolutely shocked at how much marine life there was right in front of our hotel. We snorkeled for hours and had so much fun exploring the coral reefs surrounding the Andaz beaches. We also went on a guided snorkeling excursion with Andaz and I would highly recommend it. We swam next to huge sea turtles and our guide even dove down and found an octopus for us to hold! He took us out on a boat and stopped at a huge coral reef. I'll never forget swimming side by side in the open ocean and taking in the vast magnificence. It was a pretty surreal experience. If you're not familiar with the Road to Hana, it is a long and extremely windy road that spans from Paia Town to Hana and beyond. It is absolutely a must-do when visiting Maui! The drive is full of scenic views including waterfalls, caves, flourishing rainforests, a black sand beach and much more. It is full of one-lane bridges, hairpin turns and incredible island views. To be exact, the Hana Highway has 620 curves and 59 bridges. I would dedicate an entire day of your trip to the Road to Hana and plan on getting a pretty early start that morning, It makes for a long day but it was by far one of our favorite parts of the trip. I'd recommend renting a Jeep and bringing a cooler full of water and snacks. I'd also pack a swimsuit and change of clothes for the many stops along the way. If you're going to drive the Road to Hana, I would 1000% recommend downloading the Shaka Guide app. Cameron and I randomly discovered it on our drive there and we would have been lost without it. It narrates your drive with history and valuable information such as which stops are worth seeing and which ones are best to skip. It is based off of your GPS location so it continues to navigate you even when you lose service on the windy drive. A few of our favorite stops were the Black Sand Beach in the Waianapanapa State Park, Ke'anae Peninsula and Puuhokamoa Falls. They are all must-see spots, trust me! We also made a few stops along the way for coconut ice cream, fresh fruit, shaved ice (at Halfway to Hana) and more. These little mom and pop, locally-owned food stands were full of character and make the day trip that much more fun. If you have the tendency to get motion sickness, don't completely rule out the Road to Hana. By taking it slow and breaking up the drive, I was able to keep mine under control. We stopped for frequent snack breaks, photo ops and even swam below a waterfall. We were actually able to pick fresh guava off of a tree next to the falls and enjoy a refreshing snack that was as natural as it gets. I will forever cherish the memories we made riding around with the windows down in a Jeep that day. It was truly such an unforgettable adventure! As you begin your drive on the Road to Hana, you'll drive through the town of Paia. Paia is a small town in Maui best known for Hookipa Beach, the windsurfing capital of the world. It is a colorful little town filled with local art galleries and artisan shops. You can make a pit stop on your way to Hana, but I suggest doing Paia on it's own as it is full of rustic storefronts and small locally-owned restaurants. Nestled in the slopes of Haleakala (House of the Sun) is the mystical Ali`i Kula Lavender Farm. They grow about 55,000 lavender plants and 45 different varieties of the plant on the 13.5 acre farm. 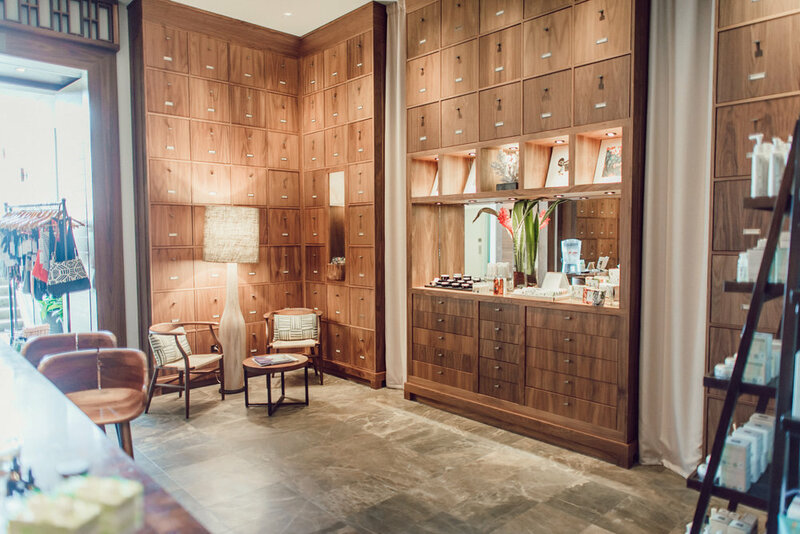 The calming smell envelops you as soon as you step foot on the property. I am obsessed with lavender so it was basically heaven for me. We strolled through the gardens (with our lavender tea of course) and explored the gorgeous property and its many gardens. We returned home with lavender everything: lavender pillow spray, lavender tea, lavender cooking seasoning and lavender honey. They even have an online shop where you can purchase all of their specialty items. It makes for a nice little morning or afternoon. It was both of our first trips to Hawaii, so we obviously had to attend a luau. A few things that set the Old Lahaina Luau apart are the warm Aloha greeting, the delicious authentic Hawaiian feast and the historic hula dances. We were greeted with beautiful leis and traditional Hawaiian mai tais to start the night. Before the luau began, they had many local artisans set up to browse and shop. That was followed by a Hawaiian feast including staple dishes such as Pua’a Kalua, Poi and fresh island banana bread. One thing that surprised me was how huge the luau was. There were nearly 500 people there. I wouldn't necessarily consider a luau a "must-do" if you're on a romantic vacation or honeymoon in Maui. However, we enjoyed our night at the Old Lahaina Luau and learned a lot about Maui's cultural history. Another favorite adventure of ours was totally unplanned. We set off in our Jeep with absolutely no idea where we would end up. We started driving along a random road and ended ended up in La Perouse Bay. La Perouse Bay offers a rare glimpse at the lava fields that once flowed there. With a black volcanic rock landscape that skirts along a beautiful aqua blue coastal bay, the area is unlike anything you've ever seen. We sat on the beautiful beach and sipped out of fresh coconuts from a local food stand. 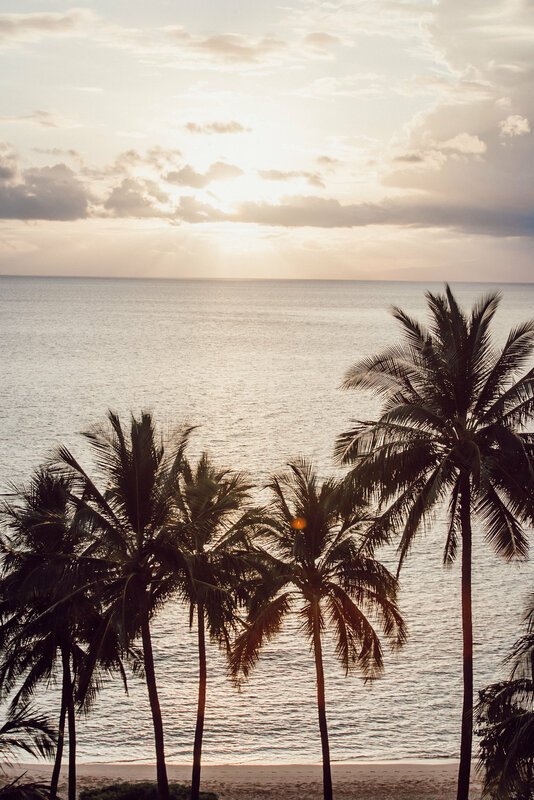 We left Maui with full hearts, sun-kissed skin and memories to last a lifetime. I can hardly wait for even more Hawaiian adventures in a few short months!